Office of the Dean, Institue of Science and Technology, Tribhuvan University published exam routine for M. Sc. Mathematics Third Semester 2075. The exam will start from 2075 Kartik 30 at 12:00PM to 2 PM. Check M. Sc. 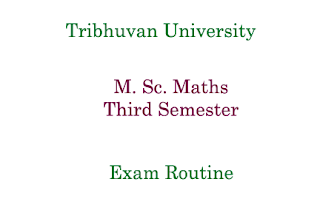 Mathematics Third Semester Routine Tribhuvan University below.